On Wednesday March 15, 2017 the Aylmer Curling Club brought home the Malahide Medal!! The Malahide Medal was first awarded in 1865, making it one of the oldest curling trophies in Canada. In current times, the Malahide Medal is vied for each year by members of four curling clubs: Aylmer, St. Thomas, London and Highland (also of London). The competition is played with either two or three rinks from each club. A round robin format is held so each club plays a rink from other club once. This results in three games played by each team throughout the day. The winner is determined by cumulative points gained by each club after all games are played which unlike a typical bonspiel, only the total number of points scored by a club matter. Congratulations to the two teams that participated Paul Steinhoff, Derek Rozan, Brad Walker, Ben Vandermeer, Jack vanKastern, Jack Gaudette, Dennis Boadway and Rick Cooper. On Sat. 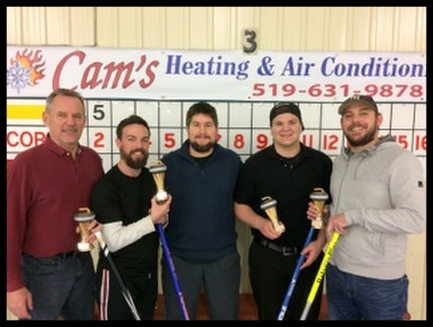 February 4, 2017 the Aylmer Curling Club hosted the 6th Annual Cam’s Heating and Air Conditioning Bonspiel. Cam Thompson has semi-retired from the business but his family continues to operate a very successful company. Sons, Bryan and Steve decided this year to continue to sponsor this bonspiel. This 6th Annual spiel had 2 full draws with 8 teams competing in each division totalling 64 curlers for the event. The Team of Jack vanKasteren, Lead – Mark Stockford, Sponsor Steve Thompson, Second – Jack Gaudette, Vice- Tom vanKasteren won the first draw and accumulated enough points to overtake the winners of the second draw to become the overall spiel winners. The rink of Blake Bennett (skip), Mike Van Noord (vice), Terry Shackleton (2nd), and John Van Rooijen (lead), (Fred Petersen also skipped the 3rd game in place of Blake) were the winners of the second draw. The Aylmer Curling Club would like to thank the family of Cam’s Heating and Air for their continued support of this event.